So all you foodies out there will commiserate with me on this post. Don't the above photos look healthy and delicious? Funny you say that, they are!! Call me crazy, but I absolutely love providing for my family in terms of filling their tummies with good for-you-fare. All three of the above are packed with nothing but healthy, oh so yummy goods. This is the absolute easiest recipe you'll come across. Not only is it one bowl, mix, pour, and bake but it requires NO KNEADING! Did you hear that, no arm workout today!! This truly is a no-fail recipe. 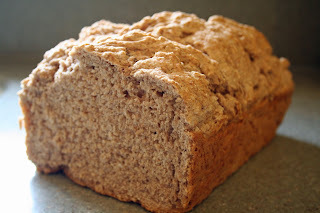 The bread fills your kitchen with incredible aromas, comes out perfectly golden brown, and is dynamite with your favorite soup or plain right out of the oven slathered with your favorite topping. 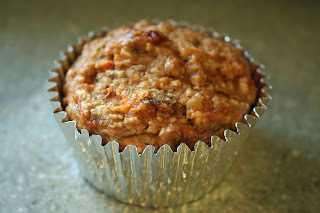 Whole Wheat Flour, oat bran, figs, shredded carrots, walnuts, and applesauce in place of most of the oil. Does it get any better than that? Of course this is an abbreviated ingredient list but I just wanted to highlight what makes up the body of goodness in this little morsel. These are great for snack time or a quick breakfast on the go. Mmm., mmm, mmm! What can beat Omega 3 goodness, belly filling starch, and greens galore? All three of these "musts" compirse this meal. 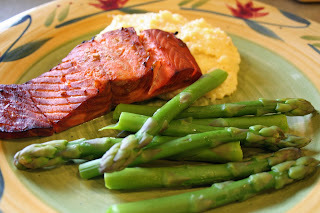 The marinated salmon flakes easily and melts in your mouth, the polenta compliments the fish well, and the asparagus never fails to leave your pee with that unmistakable aroma (oh gosh, Grandma sorry if I've offended)! No really, I love a meal like this. And you know what worked well? Zack (the hubby) must have bread with a meal like this. So what did I have available? Well the Beer Batter Bread was sitting on kitchen counter just asking to be consumed. Zack sliced off a big ol' slab, buttered it generously and enjoyed it with this meal. Perfect! It feels so great to be back into the swing of things, actually preparing meals for the fam. If you too, want the satisfaction of divine domesticity I'm willing to share my recipes. Just let me know! Eternity, however, is the promise for you. Right into the arms of our loving Savior. Entering heaven, the greatest gift to acquire! And tomorrow, I promise you food pictures. Salivate, you will! So what will you see? Hows bout' some Whole Wheat Beer Batter Bread; Nutritious Bran Muffins; and a dinner of Marinated Salmon, Parmesan Polenta, and Asparagus. Good things await you! In the midst of the craziness that has been the past two and a half weeks it felt so good to collaborate with the kids on a spring craft. The above photo models our results. 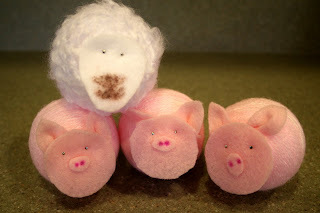 These little animals are simply too cute for their own good and relatively easy to make. It's our little way of saying Happy Spring to you! What a blogging slacker I've been, huh? Blogging, unfortunately, has been the least of my worries most recently. Suffice it to say that our guarded optimism regarding Zack's dad was quickly dashed. How can a person go from a seemingly inconsequential hospitalization on February 14th to a blessed end to suffering on March 11th? Zack and I are reeling in a current state of surrealism. It's hard to believe, hard to accept, and absolutely shocking that George has passed on. 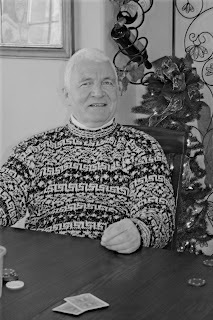 I've got so much more to say on this because having been present for a good part of his last two weeks, and there with him when he passed, my life has been altered. I'm currently in a state of processing so bear with me through the next few weeks of posting ya'll. And by the way, I just want to thank everyone for their positive response to this outlet of mine. It truly is a joy for me to share my life with you, and such a great hobby for me. Stay tuned because there's a whole lot more to come! Till then, ciao (just pretend with me that I'm Italian, capiche? Right now it just sounds oh so "Calgon take me away"! ).